Very simple whiskey. Nothing special. Little bit worse than average. Smoky malt tones are accompanied by a hint of vanilla. The whole thing looks very youthful. Very rough with neat fuselages. Burns very much on the palate. Otherwise sweet, with smoky malt and the notes of spices and vanilla. Spicy finish and very warm. This is not a light version of Black Label. Drinking it neat provides an experience that is much less impressive than Black Label, with no particular flavor standing out. As with most basic blends, this seems more for mixing than drinking neat. It’s a competitor in the same category as Dewar's White Label or Cutty Sark. Cereal malt, fruit, oak, and a slight beer note. Sweet speyside fruit, slight peat smoke, and another touch of yeast/beer. Very short and unremarkable. Perhaps a touch of lingering caramel and smoke, but that’s all. 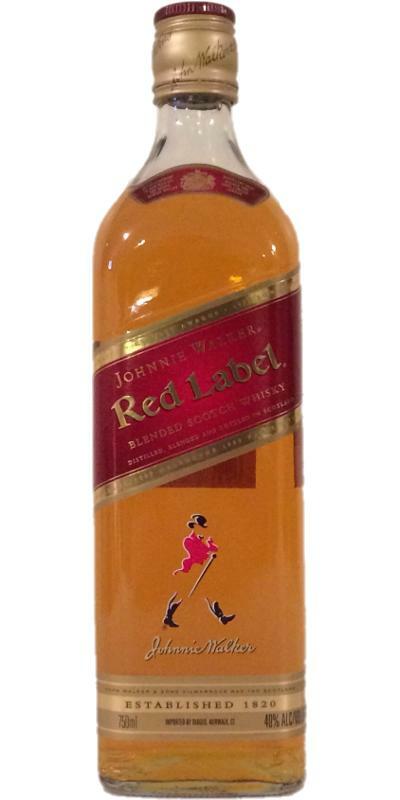 Johnny Walker Red label is marketed as a mix drink by Diageo and I suggest you follow that advise. Use it as an appetiser with ice and soda or mix it with Coke (or Pepsi, I'm not in for a "Who's better" debate). Drinking this one neat is far from a life-changing experience. In that case you'd better pick a Black of Double Black label off the shelf. You cannot call this a bad whisky. Certainly not if you take the price into account. Paying more than € 17 would be considered a bamboozle. But there are plenty more bang for the buck whiskies than this. I put it in the same category as the typical pub white wines. Serve and drink without pretensions. Juniper berries and overripe pears are the main aroma's I'm picking up at the nose. After a few sniffs there's some sort of synthetic component that makes an appearance. I can only identify it (for now) as plastic wrap that spent too much time in the oven. At room temperature there's a touch of imitation leather, sweet grains and dry baker's yeast. On the palate there's an explosion of soft peat smoke, toasted oak and a mixture of spices. Juniper berries, ginger and pink pepper. And a hint of soft soapiness. But don't worry. It does not get very unpleasant. The finish is quite short. An extinguished fire with flakes of oak and pine resin. Very aromatic, indeed. Sexily earthy. Peaty, junipery, fruity. Very lively. Scenty spiciness. Gingery. Comes on hot and strong. Island smokiness and saltiness emerging: lingering and insistent.